When I got back into fantasy books a year or so ago, I noticed that there seems to be a quite pronounced scarcity of monsters and nonhuman humanoids in the vast majority of works. When you talk with people about Sword & Sorcery, many have a very firm stance that it has to be human-only and that you can’t maintain the structure, dynamics, and themes of the genre if you include elves, trolls, or dragonmen. Today I came across a short article on another site which I’ve read and very much liked a while back, by a person whose opinions and understanding of the workings of fantasy I usually very much agree with and respect. The main thought was that monsters should be very rare and be limited to the truly unnatural, with a very distinct separation from normal wildlife. And I very much agreed with it, since it helps to ensure that the encounter with an actual monster will be something special and that the audience feels like there’s really an extraordinary danger. I now very much think that I was wrong about it. Much of contemporary fantasy could be accused of being mostly a fictionalized version of the middle ages with the occasional sprinkle of magic here and there, but very little fantastic elements as far as the plot is considered. But even that would not be correct as many of these worlds are really more like 20th century societies in fictional lands that use technology that superficially looks medieval. I mentioned the relationship of humans, nature, and the divine in my review of the academic book Nature and the Numinous in Mythopoeic Fantasy Literature, but I am going to lay it out again in this article that is directly at fantasy writers. The idea that nature is something that surrounds human cities and is separate from the human world, and that the divine aspect of the universe is located in a completely different place or dimension is very specific to modern western thought. It has been argued that the foundation for this is already found in the myth of the Garden of Eden, when humans were instructed by God to rule over all animals and plants, but it really developed to its current form through the ideas of Enlightenment and Humanism. (Which since the late 19th century got exported throughout the whole world together with the western education system and the modern principles and procedures of science that were based on that conception of the world, so it’s not strictly a European and North American thing anymore.) But in the kinds of societies after which almost all fantasy lands and cultures are modeled this whole concept fairly alien. Even in medieval Christianity, where the distinction between humans and animals was pretty clear, God was generally assumed to work directly in the everyday world, either actively or through agents. And the believe that there were other human-like people living in distant parts of the world was very widely spread. The land of the dog-headed men was a frequent topic among explorers and even the church had serious debates about what to do with them once their land is found. A quite common opinion was that they should be baptised and integrated into the church, just like all other humans. Assuming they are not already Christians. Fantasy is obviously something you can’t do wrong. Pretty much every world imaginable can be well suited to be the setting for a certain kind of story. But lots of writers, and especially fans, make a pretty big deal of these worlds accurately portraying the technology of various historic periods and places. And often having fictional creatures around is perceived as being too fanciful and unrealistic. But at the same time there is generally no effort made at all to even somewhat approximate the way these people saw the world. We’ve had an interesting discussion at Fantasy Faction a while back about the possibility of “mythic fantasy”, and another one just last month about fantasy books in which religion and religious believes play an important part. (In both cases the search for existing works came up almost blank.) When you look at epics from antiquity and the proto-historic periods before it, it is very easy to see how very mucg similar they are to modern fantasy books, which have of course been very much inspired by them. But in those epics, the borders between human, nature, monster, and gods is often so thin and blurred that it’s not really there at all. The book I mentioned above examines a small number of 20th century fantasy writers who went against that and deliberately set out to tie human concerns together with nature and the affairs of the gods. The gods don’t make any appearance in The Lord of the Rings, but it’s always clear that there are higher powers at work and that Sauron, Gandalf, and the elves are all major players in a conflict that is much greater than the kingdoms of man. In The Hobbit, Beorn is both a man and a bear, but different from either. You have eagles who are taking direct action in the struggle between mortals and immortals, and trees who walk and talk like humans. And of course all the talking spiders. Pretty much everything that Tolkien did was mindlessly copied countless times without understanding why he did it and what their purpose was. But this dissolving of the boundaries between humans, nature, and the divine was almost universally ignored, perhaps because it was too subtle to even notice without understanding it. There’s not really a lot of different creatures in Middle-Earth when you compare it to most roleplaying games and videogames, but all of them do not exist to create contrast between the natural and the unnatural, but to make such a distinction disappear. In European myths about fey beings, they always are as much part of nature as they are divine, and most of the time they also look very similar to humans. Even the classic fairytale witch is not just a regular old woman who knows a bit of magic, but also a monster. (Maybe I write an article about how the witch is the female counterpart of the ogre one day.) In any attempt to create “mythic fantasy”, the path into the world of spirits and magic should not lead through the wardrobe or the rabbit hole, but instead it needs to be identical with our own. 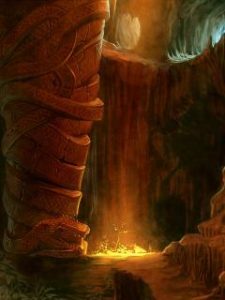 In many mythologies, the Underworld is not another dimension, but an actual cave system that can be entered through any deep enough cave. To have fantasy that is in any way inspired by myth and tries to capture its essence, I think monsters are not just permissible, but mandatory. Without them and the dissolution of boundaries they present, any work can not go beyond the scope of pseudo-history.